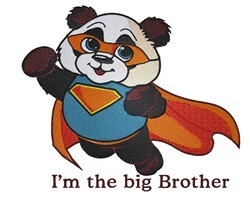 This design is a grand way for big brother to make an announcement of the new addition in the family, on t-shirts, hats and more! King Graphics is happy to present Big Brother Super Panda machine embroidery design which has 30687 stitches and is [145.80 mm x 124.46 mm] large. If you would like to view more embroidery patterns please search on our embroidery designs page.